Australian PM Malcolm Turnbull has stared down calls for his resignation amid an escalating leadership crisis that has crippled his government. Mr Turnbull is fighting to retain his position amid a push by senior colleagues to replace him as leader. But he has said he would not contest the leadership if his rivals in the Liberal Party secure enough support to bring on an internal vote. The government suspended parliament on Thursday to try to resolve the crisis. Mr Turnbull told reporters that Australians would be "rightly appalled by what they are witnessing in their nation's parliament today". What position is the PM in? 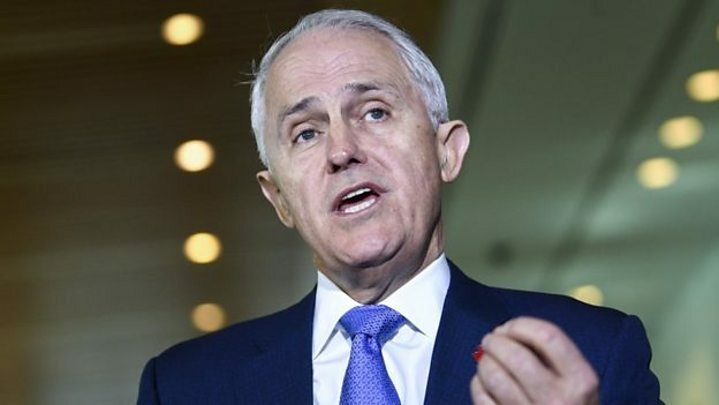 Mr Turnbull has vowed to hold a party meeting on Friday to see if he is still supported by a majority of MPs. If his rival Peter Dutton produces a letter with sufficient signatures, Mr Turnbull has said he will vacate the leadership. That would bring on a leadership contest. In that situation, Australian media say Mr Dutton could face off with Treasurer Scott Morrison and Foreign Minister Julie Bishop. Mr Turnbull has said he would not run. Why has his party turned on him? Mr Turnbull has endured poor opinion polls, losses in recent by-elections, and a revolt by the conservative wing of his party. In an attempt to appease conservatives on Monday, Mr Turnbull abandoned plans to set an emissions target in legislation. But it made little difference: Mr Dutton launched a leadership challenge a day later. Although Mr Turnbull won, the narrow 48-35 vote was seen as damaging. On Thursday three senior frontbenchers - influential Finance Minister Mathias Cormann along with the employment and education ministers - resigned, dealing a major blow to the PM's chances of clinging to power. They joined a string of other ministers who have either stepped down or offered to. Mr Cormann, a key Turnbull supporter, said the prime minister no longer had majority party support. What does it mean to suspend parliament? It prevented an entire session of Question Time, where the prime minister faces MPs in parliament, ahead of an already scheduled two-week break. This was seen as an extraordinary move. It also means all parliamentary business is halted, so no debates can be held or new laws passed. There were jeers of "you're a disgrace" from the opposition benches as the House of Representatives voted 70-68 to break until 10 September. Opposition Labor Leader Bill Shorten said the country "no longer has a functioning government". "The government may adjourn the parliament, but they cannot outrun the weight of failure of this government," he said after the vote. Inside Parliament House, only one thing is clear - Malcolm Turnbull's time as prime minister is coming to a chaotic end. Journalists and politicians have been frantically stabbing at their phones in the hope of working out exactly what happens next. Who will be his successor? Who has the numbers? Could there be a snap election? Australia may be familiar with regularly culling its prime ministers, but it's a bloody business that doesn't follow a neat, orderly script. Meanwhile, the normal business of governing has been suspended while the ruling party has its own civil war. The past decade has been marked by a series of leadership coups, with three sitting prime ministers deposed by party rivals. Not a single leader in recent times has succeeded in serving a full three-year term as prime minister. But in recent years, prime ministers unpopular in the polls - or with their colleagues - have been swiftly sacrificed from within.